Emory Law prepares students to meet the challenges of an evolving, complex, and global legal environment. 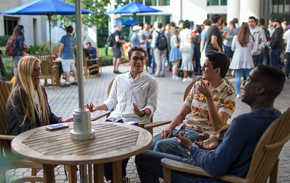 Emory Law has it all: faculty who are experts in their respective fields of law and dynamic teachers in the classroom; countless opportunities for hands-on, experiential learning; and an environment of support and cooperation that encourages challenging the status quo. Students looking for a top-ranked law school—known for its exceptional scholarship, superior teaching, and demonstrated success in preparing students to practice law or enhance their professional careers with a graduate degree—should apply.